Died February 7, 2019, beloved wife of James, much-loved mother of Robert and Angela and devoted grandmother of Michael, Rory, Robbie, Rhiana, Romy, Tylan and Aston. Ann will be resting in her home, 29 Eccles Street. Funeral Service will be held at Matchett Street Gospel Hall on Wednesday 13th at 9.30 a.m. and afterwards to Roselawn Crematorium for 11.30 a.m.
Family flowers only please. 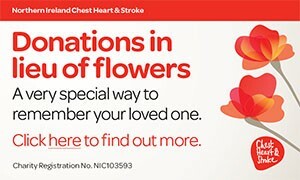 Donations in lieu, if desired, to NI Chest Heart & Stroke c/o Stephen McCosh Funeral Directors, 117 Shankill Road, Belfast, BT13 1FD. where our loved one lies sleeping never to be forgot. Deeply regretted by her sister-in-law Marlene, partner William, nephew Craig, niece Judith, husband Darren and Ellie. Will be sadly missed by her friends Barbara, Albert and family. Deeply regretted by her friends Iris, Billy and family. Tomorrow is promised to no-one. I am sorry to tell you that Ann (Peden) MOORE has passed away.